Leadership roles may offer the best options for advancement, but you may not get the best cooperation from those who are angry at the system. Be alert to the possibility of undermining, and have a backup plan if you want to avoid embarrassment. Your body may be extra-sensitive, and you can experience inflammatory reactions if you become ill or if you’re exposed to something that’s toxic for you. Avoid suspect environments or foods from February 1 to 8, and diminish high-risk activities after February 24. Opening to the spiritual quality of love allows you to reach a new dimension of intimacy, particularly during the solar eclipse on February 16. 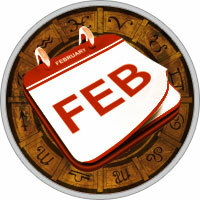 Troubled relationships are likely to fall apart from February 1 to 7, especially if you’ve had a change of heart. Your expectations may be unrealistic, or you could run into others who create trouble after February 14. You may not get everything you want from business negotiations until after the Sun’s eclipse on February 16. Prior to that, you’re likely to run into power struggles over budgets or differences in values. To reach contractual agreements, make sure that you’re not the one putting in all the resources while the other guy gets most of the benefits. Be wary of people at work whose attitudes seem shallow. Trust your intuition. Communication fares best from February 1 to 13, and innovations stimulate changes in your career path from February 1 to 4. Keep your eye on the fallout, though!